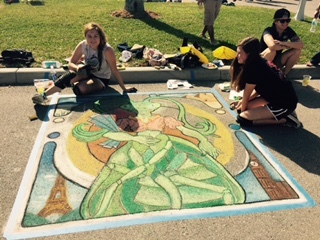 Congratulations to our Bishop Verot artists for their First Place chalk block during the Ft. Myers Artfest's Chalk Block competition in downtown Ft. Myers. Candace Getgen and Sam Cook earned a First Place ribbon for their excellent work. Andres Johnson, Arden Whiteside and Ariel Jiang created a beautiful block as well. Art student's from area high schools spent hours creating fabulous blocks of art for all to see while walking the Artfest.